The most prominent area monument constructed to memorialize the victims of the Armenian Genocide, or the “martyrs,” is this stone structure built in 1977 and expanded in 1998. The idea for a monument was introduced in 1971 by local resident Peter Tikoian, chairman of the board of trustees for Sts. Vartanantz Church in Providence. Tikoian proposed that the three Rhode Island Armenian churches—Sts. Sahag and Mesrob, Sts. Vartanantz, and Euphrates Evangelical Church—jointly organize the planning and construction of a monument to commemorate the memory of the 1915 Genocide. The monument consists of a central domed arch over an etched collage of Khachkars, or Armenian stone crosses, which very closely resembles the towers of the Mother Cathedral of Holy Ethcmiadzin in Ejmiatsin, Armenia. A smaller, less ornate Khachkar sits atop the dome. The structure stands 29ft. high, 27ft. long, and 5ft. wide, and was carved out of a natural-color granite mined from Vermont. There is one smaller stone on each side of the archway, each inscribed: “We Armenians dedicate this monument to the immortal memory of the 1,500,000 Armenian martyrs massacred by the Turkish government during the 1915 Genocide,” in Armenian on the stone to the right and English on the left. In 1998 the Martyrs’ Memorial was expanded to include two polished stone walls that curve around the original edifice, with a stone walkway at the base, and another, larger inscription stone embedded within. Like other ethnic communities in Providence, the Armenian community has a number of monuments in the city to memorialize their heritage and the continued influence of the Armenian Genocide in the community’s identity. The most prominent monument constructed to memorialize the victims of the Genocide, or the “martyrs,” is a stone structure built in the North Burial Ground in Providence in 1977. 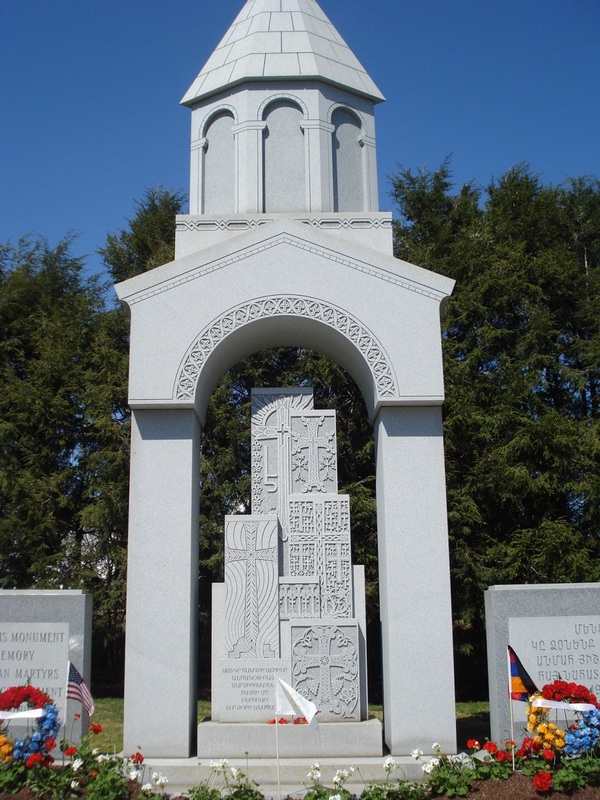 The initial idea for the construction of an Armenian martyrs’ monument was first introduced in 1971 by local resident Peter Tikoian, the chairman of the board of trustees for Sts. Vartanantz Church in Providence. It was Tikoian’s idea to have the three Rhode Island Armenian churches—Sts. Sahag and Mesrob, Sts. Vartanantz, and Euphrates Evangelical Church—organize the planning and construction of a martyrs’ monument to commemorate the memory of the 1915 Genocide. To find an ideal location, the committee held a number of meetings with the Park Commissioner of the City of Providence and, from a list of fourteen possible sites in the city, the committee ultimately chose an empty plot of land near the entrance to the North Burial Ground in May 1972. The North Burial Ground is the resting place of some of Rhode Island’s most prominent public figures, including members of the Brown family, Horace Mann, and Stephen Hopkins, as well as hundreds of ordinary Rhode Islanders throughout the state’s history. Still an active cemetery, the North Burial Ground, along with the Swan Point Cemetery, is used as the final resting place for the deceased members of the three Armenian churches in Rhode Island, none of which have their own, on-site cemetery. The land at the entrance to this site was finally leased to the committee by Providence Mayor Vincent Cianci, and the Providence City Council on 5 December 1974. A report published by the Armenian Martyrs’ Memorial Committee in 1977 explains that, in 1973, the committee reviewed a number of suggested prototypes for a memorial structure, ranging from a pavilion to a small memorial garden. Ultimately, the design of the final structure was created in a collaborative effort by the nine-person Memorial Committee and the representative clergy of the three churches. A ground-breaking ceremony was held on 27 April 1975 and was attended by members of the Armenian community of Rhode Island, along with community leaders, clergy, and a choir. The job of constructing the memorial edifice was given to the Rock of Ages Corporation of Barre, Vermont, where committee members frequently visited the factory and met with contractors at regular intervals to oversee the progress of the stone construction. According to a summary by the Armenian National Institute, the monument itself consists of a central domed arch over an etched collage of Khachkars, or Armenian stone crosses, which very closely resembles the towers of the Mother Cathedral of Holy Etchmiadzin in Ejmiatsin, Armenia. There is also a much smaller, less ornate Khachkar at the top of the dome. The structure stands 29ft. high, 27ft. long (including one inscription stone on either side of the arch), and 5ft. wide, and was carved out of a natural-color granite that was mined from the Rock of Ages quarry in Vermont. There is one, smaller stone on each side of the archway, each with an inscription that is in both English and Armenian. The inscription on the front of both stones reads: “We Armenians dedicate this monument to the immortal memory of the 1,500,000 Armenian martyrs massacred by the Turkish government during the 1915 Genocide”, in Armenian on the stone to the right and English on the stone to the left. The inscription on the back of these stones, from the Battle of Avarair in 451 A.D., reads: “From this faith no one can shake us: neither angels nor men, neither sword nor fire, nor water nor any blow however bitter it be.” The architectural structure of the monument is of Byzantine influence, particularly the small dome at the top of the arch, which was given the appearance of being supported by four small columns. The design of this dome, according to the Armenian Martyrs’ Memorial Committee, depicts a very common form of Armenian architecture popular in Armenia during the seventeenth century. These new additions to the monument were completed and dedicated in a ceremony on 25 April 1999. Since its original construction in 1977 the Armenian Martyrs’ Memorial Monument in the North Burial Ground has been used as the location of the annual Armenian Genocide remembrance services held by Rhode Island’s Armenian community on the last Sunday of every April. Armenian Martyrs’ Memorial Committee, “Armenian Martyrs’ Memorial Monument, Providence, Rhode Island,” (Providence, R.I., 24 April 1977).